Environment is our basic life support system. The school building, the chairs and tables of the classroom, the open field, and the friends in your class – all are a part of our environment. Our environment is constantly changing because of our needs. Human beings are modifying or destroying the natural environment. The air is polluted by car fumes, water is collected in a pot, food is served in utensils and land is used for building houses and factories. Human beings are the ones who make cars, factories, houses, vessels, pots etc. thereby modifying the environment. 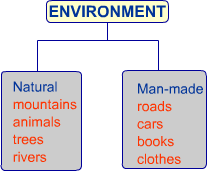 The word environment has its roots in the French word Environer / Environner which means neighbourhood. People, places, things and nature that surround any living organism are called environment. The natural component of the atmosphere comprises of air, water, land and living things. The natural environment refers to both biotic and abiotic conditions. The biotic conditions consist of the world of living organisms e.g. plants and animals. The abiotic conditions consist of the world of non–living elements like land. The human made component of the environment are the creations by human beings which include bridges, roads, dams, parks and monument etc. 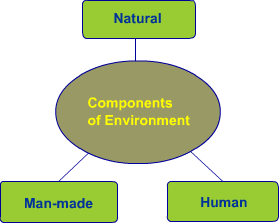 Human environment reveals activities, creations and interactions among human beings.